This is a privately owned unit and guests are renting directly from the homeowners whose company name is Hanalei Vista Condos (as will appear on your credit card statement). Therefore your reservation is non-transferable between other properties. The regular occupancy for 6303 is 6. The regular occupancy for unit6304 is 2. The regular occupancy for 3303/04 is 8. Guests are obligated to disclose the actual number of occupants prior to arrival. A pack-n-play and high chair are available at no extra charge, but must be requested via email to alohacondos@vacationrealtyhawaii.com at the time of booking or with reasonable notice prior to arrival. If more than one is needed, it then will be up to the guest to rent one from a local rental company. We provide sheets for each bed and two bath towels per stated guest. There is no daily housekeeping service, but you are welcome to use the washer/dryer in the unit if you are renting 6303 or 6303/04. If you are renting 6304 only, you are welcome to use the coin operated washers by the 8000 building. If you have an interim clean included with your reservation we will launder the linens during the clean. Please do not leave personal laundry in the washer when housekeeping is coming for the interim clean. We stayed on 3 islands while in Hawaii, and this was the best value by far. The condo(s) were nicely furnished, clean and perfect for our family. One unit had a King bed and bath. The larger unit had a King bedroom, bath, laundry, loft with 2 doubles with spiral staircase up to it and full kitchen with adjoining dining living space. Great view of Hanalei Bay from balconies. Sadly, a fire had just ruined the check in area and the Happy Talk lounge was not open, but lunch was available pool side if you desired. Newly renovated in 2015!! 2 King Bedrooms plus a LOFT with 2 queen (new 2018) beds make it perfect for large families who want to get away. The living and dining areas are spacious and breezy so your whole family will feel comfortable. New lavish well stocked kitchen. The lanais look out over stunning Hanalei Bay and the surrounding mountains with a great view of our famous surf in the winter months and amazing sunsets every night. The building is conveniently located near both pools, and it is an easy walk to the parking lot. Hanalei Bay Resort borders the 2nd and 3rd holes of the magnificent Princeville Makai golf course. Enjoy some of the best views Kauai has to offer! Private, large ceramic tiled lanai with access from living room or master suite. Bar style table and 6 chairs....great for morning coffee or a dinner with views of Hanalei Bay and Bali Hai sunsets! Plus two comfortable lounge chairs with cocktail table. Take your breath away with one of the best views of Hanalei Bay! The condo was perfect for our vacation and they were very sweet and easy to work with. I would definitely recommend staying here for your trip! Heavenly Place, best on the Island! We've stayed there several times over the last 20 years. We miss the restaurant, but the Bar restaurant was good, loved the entertainment. Spending a week in July 2017 at your incredible Hanalei Bay Resort delivered all the promises as advertised, encompassing the exceptional unit 6303-4 with its unsurpassable Hanalei Bay views, & the first class service by the resort staff with immediate & enthusiastic responses to any request or question. My family & I were highly impressed with the immaculate condition of our accommodation, the thorough & well planned & equipped kitchen, closets packed with beach gear & the blessing of the in-house laundry facilities.Perfect floor plan to accommodate the parents, grandparents & two teens with privacy for all when needed. The loft was ideal for the teens. We will look forward very much to returning in the future, & meanwhile can assure anyone contemplating reserving accommodation here that there will be no disappointments, either with the unit or with the resort, & as will be with us, the memories of this wonderful experience will stay forever. Our grateful thanks also for first class service to Kristen Greene & Graeme Merrin & staff of Vacation Realty, Hawaii. Well done! Jill & Family, Vancouver Island, Canada. Great unit, but you need to fix your refrigerator's ice vs. water "switch"
Thank you so much for taking the time to post a review for the unit 6303/04 at the Hanalei Bay Resort. We are happy to hear that you enjoyed your stay and thought the unit was great. We have someone checking the ice maker out today and the water portion seems to be working just fine. The ice we believe just was just stuck in the chute causing a block so we will get that unjammed. The lighting in the kitchen is actually exceptional in this unit so maybe you did not find all the switches. The kitchen has under cabinet lighting, recessed in the ceiling lighting and multiple cam lights above. All of these lights are on dimmer switches so it is possible you had them turned down to the lowest setting or completely off. There is a switch plate to the right of the kitchen with one switch for one set of lights and then 2 other switches on the left side of the kitchen for the other lights. When all are lite, the kitchen has excellent lighting. With the proper lights in the kitchen on, I am sure you would have been able to read the stove settings. However the stove settings also has a switch to turn the settings display on and off so they could have been off. We will pass on the suggestion about the desk for working on line but meanwhile we hope our guests will use the table on the lanai and enjoy the view while working or use the dining room table that has ample space. We wish you would have contacted us about these things so we could have cleared them up for you during your stay. Thank you again for taking the time to post and we hope you can come again soon! Absolutely stunning! This condo did not disappoint in any way. My family of 6 loved every second here. I can't wait to go back. You can happily spend your entire time at the resort and be totally happy. The staff at the resort were also so friendly. The view is magical and the amenities that were available in the condo were all new from the beach chairs to boogie boards and snorkeling gear. I loved the kitchen and we cooked all our meals right there. Just loved this condo. And can't wait to go back. Thank you for the wonderful review and taking the time to post your comments. This condos is stunning and the owners have put a lot into this unit to make it extra special! The views are amazing and make the experience even more memorable. The unit is very accommodating and does have all one needs to have a great vacation. The resort amenities add to the great appeal. We do hope you will come again soon! This is a lovely resort and our units far exceeded our expectations! Our family of 5 stayed here for a week and were very comfortable. The view from the balcony was amazing! I would highly recommend this resort and in particular, the condo. We are already looking forward to our next stay here! This condo was perfect for 2 families with kids - the parents got the rooms and the kids shared the loft. A 3rd family in our group rented the condo below our unit, which allowed us to have our big group together. The unit was recently renovated. It had a great kitchen and the entertainment systems throughout were great. The kitchen was well stocked and we were able to make almost all of our meals for our 3 families. The one frustrating thing about the kitchen was the dishwasher, but once we figured it out, we were able to use it (the dish rack was not in right and therefore did not allow for the front to close.) One of the air conditioning units failed, but maintenance was alerted and they came by to fix it right away. The views from this unit were spectacular and the resort was nice. The one downside to Hanalei Bay Resort was the pool was not heated and it was too cold to use most days (I jumped in maybe twice). Most guests huddled in the hot tub. I would suggest heating the pool during the winter to make the pool more appealing. The people at Aloha Condo rentals were very responsive to all of our needs and helped whenever there was an issue. I would rent this unit again and also other units from Aloha Condos. Thank you for taking the time to give your feedback on unit 6303/4 at the Hanalei Bay Resort. We are pleased to hear that you enjoyed the unit and would rent this unit again. It has been so beautifully renovated with high end finishes and the views are absolutely spectacular! It is spacious and accommodates 8 easily. We are sorry for the issues with the new dishwasher which has since been serviced and is working wonderfully now. We are happy to hear the response from the maintenance was quick and efficient as well as your pleasure with the property management team. We are here to help and make your stay a great one. We hope to be able to serve you again in the future! The combination of using both 6303-4 for a family outing was fantastic. The combination allowed us to maintain some personal space while at the same time making us feel we were all together. As a group we had grandparents, children and grandchildren. Grandparents took room 6303, parents took the master bedroom of 6304 with the large lanai and the fantastic views of the bay and mountains. Our common meeting area was the kitchen, dinette and living room, with Lanai. The grandchildren (2) boys stayed in the loft. Each space and area was exactly like the photos but better in real life including all furnishings. Although the Condo is on the third floor, the first floor is recessed, so it was only a short distance up. The location was ideal. Short walk to parking, short walk to beach at either the St. Regis or Hanalei Bay. If we were going swimming in the bay we found that getting in the car and driving around was not required. You could just walk down to the river at the bay, which was shallow, and walk across in the water and you were right at the pier. Kayaking, paddle boarding, etc. was close by on either side. The one dinner we ate out at the St. Regis bar area, outside, was excellent. 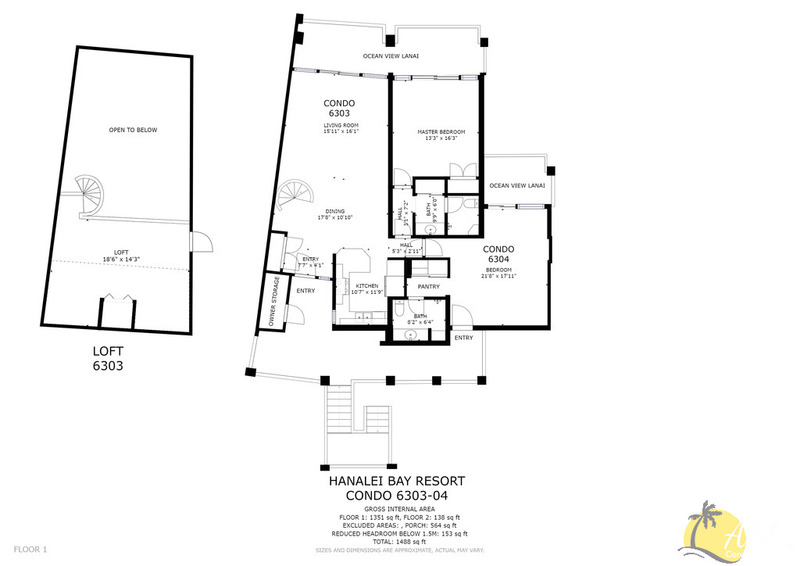 We all had a great time in a large part due to the accommodations of the Hanalei Bay Resort Condo units 6303 and 4. We loved this condo. It was perfectly laid out for our family of 5 and MIL. The attached suite was perfect for her to escape when she needed to but still be with us. Her unit was just as lovely. The decor was nice, especially the beautiful artwork. The lanai was our favorite spot. What a view. It was my favorite breakfast spot. There was plenty of room to spread out. Kitchen was well stocked as was the closet of beach supplies. Really made the experience lovely. Thank you so much! A haven of comfort in the midst of paradise. This condo is spacious, centrally located, tastefully decorated, and perfectly equipped. The views from the balconies are stunning: it was a treat to eat breakfast and dinner while looking out onto Hanalei Bay and, in the evening, the sunset. All of the resort amenities -- pool, tennis, beach -- are an easy walk from the condo. We will stay here again! Wow! What a rental! What a view!! What can I say? This condo rental was exactly as described and as pictured! The owner has spared no expense with furnishings, bedding, kitchen utensils and towels. There was not one thing that we needed that wasn't provided. Great location as well. ( Close to both pools and grills.) If we are ever blessed enough to go back to Kauai, we would stay in this condo without a second thought. Very nice facility. Clean and in good condition. Fairly priced. Beautiful grounds and breath taking views! We spent 5 nights here with three generations -- grandparents, parents, and our 3-year-old and 4-year-old. Despite the pool being closed for renovations and the lobby and restaurant being closed following a fire this summer, we had a terrific time! The setting is gorgeous and the beach, while a bit of a walk away down a paved path (you can also take a very convenient golf cart "shuttle" to the beach and back), is beautiful and perfect for kids. We enjoyed exploring the Hanalei Bay area and beyond. The view from this unit is incredible, and the entire unit was impeccably clean, nicely decorated, and in excellent condition. Aloha Condos was very response to our needs and questions throughout our stay. A well managed, beautiful unit in an unbeatable location! We loved the condo. Everything we wanted was there. The furniture is very comfortable including the kitchen chairs, the couches, and the beds. Plus there were ample beach toys, a plush high chair and a portable crIb. We enjoyed the outdoor balcony's view and furniture immensely. There were plenty of dishes, glasses, knives, pots and pans, and even an espresso maker. We expressed to each other on a regular basis that the condo was full of quality and made us feel welcomed by true friends because of how much generosity we felt. Kristin and the owner really do a top quality job. We enjoyed our stay at Hanalei Bay Resort and found the accomodations very comfortable and clean. The advertisements are not misleading...it was well-equipped and able to handle 10 people for a dinner meal (staying in other units). The beds were fantastic and the location was convenient for all of our activities. Our condo unit 6303-04 was postively delightful. The accommodations were complete with excellent furnishings and had a lovely view of Hanalei Bay. All service was courteous and available as needed. Our stay there was perfect in every way! The most adventurous, luxurious getaway ever. We loved Hanalei Bay Resort. My husband, sister and her husband all decided we would return as soon as humanly possible and stay in the same condo. The decor is lovely, the condo clean and spacious. The view is positively heavenly, with or without sunshine. The north shore fits our lifestyle and vacation ideal. We hope to tackle the adventures that weren't suitable in the rainy season in a future visit. Even with the rain, we managed to fill every waking moment with amazing fun. The zip line was a blast, the hike to Hanakapiai Falls was unbelievable. Trip of a lifetime. We have such a good time in this condo. It has everything we need and is very comfortable. The kids love the loft and the bedrooms are nicely decorated with good beds. We really liked the new outdoor furniture in the morning with our coffee and tea. We all enjoyed putting together the surfboard puzzle and reading the guidebooks included with the condo. We can't wait to come back again. We spent 9 days at this beautiful condo. "Beautifully appointed", but very family friendly...Condo was stocked with boogie boards, beach chairs, snorkles, insulated beach bags, coolers .Ate in most nights and kitchen had lots of dishes etc...View from lanai was breathtaking. Made use of tennis courts, pool, bar-b-que pavilion (only one? and close enough to this unit) easy walk to a nice beach...could walk/drive to other nearby beaches..Very peaceful. Teens and adults were happy. This place was a 10 for our family! A charming unit furnished with taste, artistry and practicality, with a great view to enjoy from every deck. As long-time owners, Hanalei Bay Resort is one of our favorite places to be. My husband and friends were pleasantly surprised to find HBR Condo Unit 6303-4 aesthectically pleasing on the inside as well as the out. The view of Bali Hai, from this unit, has to be one of the best and we appreciated the great location in proximity to the beach, bar and parking lot.This condo has that "home away from home" appeal with obvious updates and recently painted freshness. Nice little updates that were appreciated included quality bedding,huge TV viewing,a well equipped kitchen and appropriate stemware for those nightly lanai Mai Tai's. Thanks to the owners for thinking of the needs of your guests. We'll be back 2011!